Email marketing and list building… We know we have to do it, but how much time do we really spend on it? This year I decided to make it a top priority in my business. As much as I love social media it moves fast and not every update gets seen. However, when you email your subscribers, you are in their inbox, where the chances of being seen are much, much higher. Now, don’t get me wrong. I’m not dropping social media entirely, I’m just focusing my efforts more on my list. Which brings me to webinars. I love speaking and presenting, but I don’t love the costs associated with doing webinars. Yet, when I look at the activities in 2013 that brought the biggest boost to my email list, webinars were hands-down the most successful. And while guest posting is important to develop credibility, in terms of building your list, nothing really compares to webinars when you consider you have a very targeted list of people who have signed up to receive information and possibly buy from you if you have something to sell. Webinars allow you to share your expertise and further build the know/like/trust factor with your community. There are several reasons that led me to try out and change to this new technology. Save BIG on webinar fees. Google Hangouts on Air are free! No need to pay high monthly fees, especially if you are not doing webinars very often. Unlimited Viewers. You don’t have a limit on how many people can view your Hangout On Air, unlike webinar plans which generally have limits and require more money for more viewers. Share your screen or share your smiling face. You can make it as casual or as formal as you like. Automatic Recording. Your event is automatically recorded to YouTube so you won’t have to worry about forgetting to hit record. Your recording is ready for replay right after the event. This is by no means a “cheap” alternative. Industry-leaders are using this very same method to engage with their community and prospects to make sales! With Google’s Hangouts On Air, you can take advantage of webinar list-building perks without the associated costs. My goal was to bring new subscribers to my list so I marketed the webinar outside of my existing list and a 3 month period I was able to grow my list by 35%. I was not creating new content each time, in fact, it was the same webinar that I would improve upon each time. In terms of time investment, these webinars were around 30 minutes. I’ve experimented with the time of day and duration. The great thing about Google Hangouts On Air is that you can do them as often as you choose! No need to worry about the recording, either. It gets streamed to YouTube and you can share the recording with your attendees after. You also won’t be able to email your attendees like you would from a webinar platform, but you will have those people in your own email list – which is much more valuable. Other than that, there really isn’t any sort of catch with hosting your webinars on Google instead of another webinar platform if you’re not looking for fancy bells and whistles. As I mentioned, Google Hangouts on Air is not webinar software so there are a few steps you need to take. The good news is that you most likely already have the tools at your disposal. 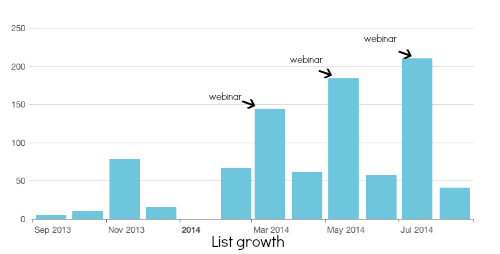 Mailchimp: I set up a list specific for the webinar with corresponding autoresponders. YouTube Live Events: This is where I create an unlisted YouTube event and schedule it for my webinar date. I also grab the embed code for my ‘watch page’. Leadpages: I use Leadpages for my webinar opt-in page as well as my webinar watch page. The webinar watch page is the page where I embed my Youtube video code. This is the also the link that attendees will receive and where they will show up live on the day of (no need to join Google+). Note: This can all be done with a regular WordPress page. Chat Roll: I use Chat Roll to engage with attendees. This is paid service, but there are many free alternatives you can use. Powerpoint/Google Slides: I use either for my slides, but you can also choose to forgo the use of slides and just screenshare your desktop or go on camera and connect with your audience that way. The first time I set up my webinars took me the longest as I had to figure out all the moving parts, however, I made sure to document the process because once I did the first one, I was hooked! I often get asked, is this still private? The answer is yes, depending on how you set up your YouTube event. If you set up a an unlisted event, it ensures that your webinar won’t get broadcast to your personal profile on G+ or available on your YouTube channel unless you choose to. There you have it. You have everything you need to get up and running and make webinars your #1 list building strategy. Do you plan on adding webinars to your marketing strategy this year? Let me know in the comments! Editor’s Note: A version of this post originally ran on Sandy Sidhu Media. Sandy Sidhu is digital strategist and idea igniter who helps entrepreneurs and small business owners from coaches to creatives master online marketing, systems and technology. With 10 years experience in the technology sector as a team leader and software engineer, her strength is translating the technical into the achievable so business owners can meet their goals using the Web and social media. She has been featured on CNN, Female Entrepreneur Association and other leading websites and a frequent speaker on social media and technology. Get her free ebook, "How To Create, Promote and Profit with Webinars" here.